The first post I ever wrote for the Wages of Win network was about my beloved Celtics and how people should not be surprised by their success against the Cavaliers (see here). One of the key points in the article was that minute allocation and inefficient use of resources by their coach Mike Brown was what led the Cavaliers on the road to perdition. After I wrote this I started to think on past situation where of teams that were successful in the regular season but dramatic failures in the playoff. This idea stayed in my head and gave birth to a Half-Baked Notion. Is there something inherently different about the regular season and the playoffs in the NBA? Is there something that jumps out that dramatically changes the game? I believe that there is : Minute allocation & how wins produced are affected by that allocation. We continuously hear terms like playoff rotation & playoff minutes thrown around come playoff time. When we take a look at the data we’ll see that the pundits may just be right (stunning I know but even a broken clock is right once a day). So what have we learned. A good deep team filled with average and above average players will get you in the playoffs but to get far in the playoffs you need your wins to be concentrated in your Top 6. So at the end of the day Pat Riley looks even more brilliant (and thus ends my streak of not talking about the Superfriends ). A question here might be if some teams are messing up when they have a good bench. If you have an above average bench (let’s say gets you 25% of your wins), then that bench would win you one of the needed series in the playoffs. On the other hand, a top heavy team that gets in (cough Boston) can get away with ditching their bench. I note my Denver team fell prey to this. They had Lawson, Balkman and Birdman on the bench but of course relied on the great Melo, Martin and Smith. Of course their explanation for playoff wins is coaching, mental toughness and experience. . . .
It’s almost like coaching only really matters in the playoffs. So a bad coach doesn’t stop you from getting in the playoffs but can completely derail you once there. Well a good point to make is the value of a win. In the regular season in theory a win is worth 1/55 of the requirement of a “Champion” season. In the playoffs it is worth 1/16. A coach has the ability to lose a team wins in both the regular season and playoffs. Oddly this does not appear to be the result of excellent play calling or making players better but as a result of minute allocation! Anyway in the playoffs any mistake a coach has had on minute allocation (Denver and Cleveland e.g) gets magnified big time. Whereas a coach with a good big 3 has a good shot of winning just by following conventional wisdom and playing the heck out of them. I would be interested in what these numbers looked like for only the top teams. It could be possible that Championship teams get more bench production than other playoff teams but that this gets averaged out. 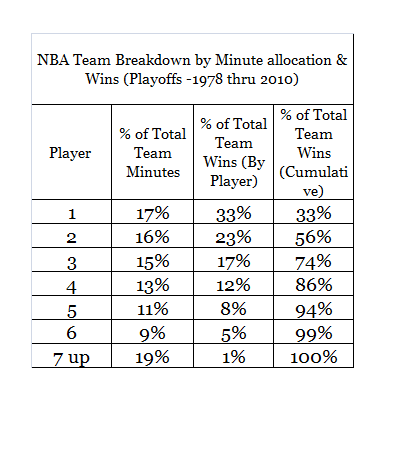 We also always hear about how coaches ‘shorten their bench’ in the playoffs, which is verified by your minute data showing that the top 6 players go from 70% of team minutes in the regular season to 81% in the playoffs. Since the top 6 players are presumably the better players on a team, it makes sense that they would generate more wins when they play more minutes in the playoffs. So presumably a “top heavy” team would win plenty of games in the regular season if they players don’t get tired/hurt, and a deep team would win in the playoffs if the coach didn’t shorten his bench. Turning to my Chicago Bulls, as I usually do, this may validate their concern about McGrady’s or Shaq’s willingness to function as a bench player. Beyond the 6th man, the bench players must be willing to play reduced minutes during the season and few or no minutes during the playoffs, assuming the first six players stay healthy. Since the Bulls are unlikely to win a championship in the immediate future, their hope is that their young players blossom. Therefore if the team hopes to win a champion ship in the next five years, their young players must get playing time, although the hope is that they earn it. Kurt Thomas has demonstrated that he can still play very well when necessary (i.e., when Bogut was injured), but that he doesn’t need to play to be a positive influence. Perhap this is because Kurt Thomas was never a top scorer in the league, and always earned his keep doing dirty work without glory. Top scorers get more credit than they deserve, and perhaps have a harder time accepting a reduced role when they age. Note that although Grant Hill was once a top scorer in the league and has accepted a somewhat reduced role, he still plays starter minutes for the Suns. I would think that McGrady would also want 25-30 minutes a game, and I think the Bulls are looking for someone who will play 10-15 minutes a game during the regular season, and maybe 0-5 minutes a game during the playoffs. To this point, was the Celtics’ advantage in the playoffs that their most productive players were their starters or that some of the Cavs most productive players were not among the starters+1? Mike Brown’s rotation was screwy (technical term) in the series with the Celtics. Beyond sub-optimal use of Moon, Varejo, and Hickson, he failed to shorten the bench and it felt awkward. I would bet his top 6 players by minutes did not consume 81% of the minutes for the Cavs in that series. The varied minute allocation in the postseason makes sense. More rest between games, no back-to-backs, and more rest in-game with longer and more frequent TV timeouts. Players can go 38-40 minutes/game without the same concern for wearing down that exists in the regular season. 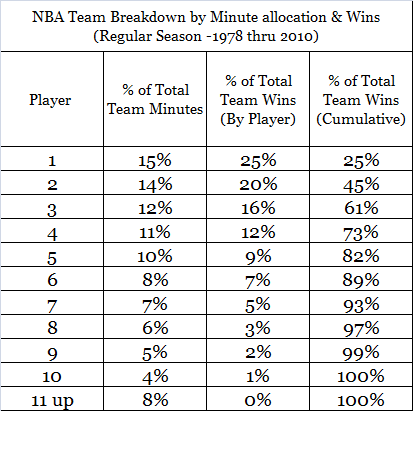 If properly managed, the starters are superior to the bench and increasing starter minutes increases win expectation. Which is to say, I think the most successful teams in the playoffs maximize playing time of their best players and do not get deep into the bench. Arturo – I’m having a little trouble I’m hoping you can help me with. Let’s say I’m the 10th man on an average team; the team wins 41 games during the season. I earn 1% of the teams wins, which is .4 wins. I do this playing only 4% of the team’s 3936 minutes (assuming no overtime), which is 157 minutes. My WP48 should be (.4/157)*48 = .125, right? (or more like .121 without rounding). So the average 10th man on an average team is an above average player? Or have I missed a step? Shouldn’t many players at the bottom of the rotation be negative contributors? I noticed that I have the minutes wrong; teams have 19680 minutes in a season, so the average 10th man is about a 0 producer. It still seems a little odd that the 10th man manages to be so ‘good’. Possible future post idea as a follow up to this. Do you want to do a post ranking the teams by their top 6 win producers? What would be the difference in rankings between rankings based on the whole team versus the top 6. On Cleveland, the players with the 10th and 11th most minutes were Jamario Moon and Antawn Jameson (the result of playing only part of the season for Cleveland). Kevin Martin was near league average and 10th in minutes for Sac and Houston (coincidence), again due to a partial season with each team. Bonner was league average and 10th in minutes for the Spurs. Humphreys was 11th in minutes for NJ with a .159 WP48. Biedrins was 10th in minutes for GS and exceeded .200 WP48. Camby was 10th for the Blazers. Most teams do not have players that good that get remanded to tenth in minutes played, but there are circumstances that place good players there. Heck, a starting 5 of Biedrins, Camby, Moon, Martin, and Nate Robinson (.090 and 10th in minutes for the Knicks) should get you to the postseason. Bring Ryan Anderson, Bonner, Eddie House, Brendan Haywood, and Vujacic off the bench and this team of tenths could host a first round playoff series. Actually, depending upon the clock — specifically, if it doesn’t show AM or PM, and is not a 24 hour clock — a broken clock can be right *twice* a day. Effort was expended for your enjoyment. Feel free to use it but only if you: share, give credit and don't try to sell it. Arturo's Silly Little Stats by Arturo Galletti is licensed under a Creative Commons Attribution-NonCommercial-ShareAlike 3.0 Unported License.